The bass guitar has 3 main parts that are constructed from wood. The body, neck and fretboard. The choice of bass guitar wood will greatly affect the tonal output of the bass. There are two key attributes to define these bass guitar wood types. Hardwoods and Softwoods. Your tone will fall somewhere on the spectrum between these two. Some parts of the bass will benefit from softer woods in certain areas. Depending on the style of play, a fretboard would instead enjoy a bright, loud sounding material to be used. Bass hardwoods are bright, loud in tone with a lot of clarity and a biting attack. Common hardwoods are Maple, Rosewood and Ebony. Left to right Alder, Basswood and Swamp Ash. Does bass guitar wood make a difference? A practical example would be to consider a bass guitar built for Jazz. The Jazz bass would be made with softer woods which compliment a smoother resonance. Now think of the same bass but used in a Punk-Rock band. The attack and the bite would be very difficult to hear in this scenario due to the absorbing properties of the bass guitar wood. In the real world, you shouldn’t be limited to an either or decision. Many bass manufacturers know this and do their best to cater to a general market in most circumstances. They will usually make their basses that purposefully overlap the tones from both sides of the bass wood spectrum. They do this by piecing 3 different wood types together. A Fender Aerodyne uses a Basswood body (soft); Maple neck piece (hard) and Rosewood fret board (hard). The combination equals a light twangy smooth, snappy bass. The Aerodyne’s bass guitar wood composition helps make it playable for almost all genres. Add in the pickup combination and you have a truly versatile instrument. The two most common woods on fretboards are Maple and Rosewood. The choice in this material will affect how your strings sound sonically speaking. When a note is played on the fretboard without an amplifier it is audibly heard acoustically from the fretboard. The resulting output from this exercise will demonstrate this materials strong point. Is it smooth, loud, soft or twangy? These attributes will affect your overall tone and what to expect. Maple, when used as a fretboard is known as a reflective wood and will produce loud clear sustaining notes. If you were to play the bass unplugged or ‘acoustically’ you will notice the loudness of the maple wood. Small bands like trios benefit from hardwoods. 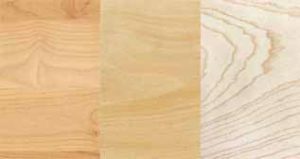 Hardwoods provide a greater output of sustain and volume through the wood body and sound louder. Rosewood fretboards on the other hand is pretty much the opposite. It can be slightly muddy in tone and the notes lack sustain. It has a softer darker feel to the tone, and is a little quieter. This is because Rosewood is of a porous nature and absorbs sound vibrations. This will however produce some lovely resonance throughout the instruments body and eventually transduce from the fretboard, to the body, to the pickups and then made audible through the amplifier. Why settle with one bass wood type? Mix it up by having the sustain of a maple neck (hard) with a softwood body for a sustained low smooth tone. The possibilities are truly limitless and only by experimenting with different basses can you find out what you like or dislike. ‘Neck Thru’ or Bolt on neck? These terms are methods of construction for necks of basses and guitars. Neck through / ‘thru’ is the method of taking a central piece of wood which would be home to the headstock, bridge plate and pick up housing in a single piece of wood. Bass bodies are comprised of two wings which are then added to the central piece. Higher quality basses with this design provide more sustain and access to higher frets. The main disadvantage is in the event of structural damage, it will be extremely difficult to repair as the bass is almost in one piece. A headstock that cannot be glued will need a new neck altogether. Bolt on basses are produced easily and cheap to obtain. An advantage to a bolt on is that they make the instrument more snappy and have a better attack. Sustain is a lovely thing but in some genres it is all about the attack. Bolt on’s are more superior in that respect. The construction is made by bolting the body of the bass to the neck piece. Typically, this joint is held by screws (not bolts as the name implies). In the event of damage you can remove the neck and attach a new one. That in its self is a great way to experiment and customise your instrument also. Modular pieces are far simpler to install than a Through Neck bass. Debates can be high between the benefits of each or which one is better. As with all things musical, everything depends on what style you want to play. Whether that’s the sustain of a Through Neck bass or the snappy biting attack of a bolt on bass. Bass guitar companies construct both bolt on’s and ‘neck thru’s’ models. Neck thru’s’ are a ‘reflection’ of a quality made instrument and can typically be more sought after. This guide for Bass guitar wood is part of the Bass Feature series. In this series we dissect the parts of the bass guitar and explain in detail how each part works. When you know and understand how each part works in conjunction of the other, it opens up your imagination to “what if i change this variable”. Our next in this series is the about bass frets. Let’s talk about bass frets – What do I need to know?